So I birthed another baby...or so it felt like it. If you saw over on Instagram last week, I have published my fourth book and this one is for all the Silhouette CURIO users! I'm so thrilled to introduce you to the "Beginner Curio Project Tutorials to Get You Cutting, Sketching, Etching, Embossing, and Stippling Now". The biggest source of frustration I see from new users is they try to tackle a project that's, quite honestly, not beginner level. That's why I've designed this 10 page starter project guide - so newbies know what's on their level! Once you learn the basics and work your way through a few beginner-level projects you can apply and combine those same skills for more advanced projects. 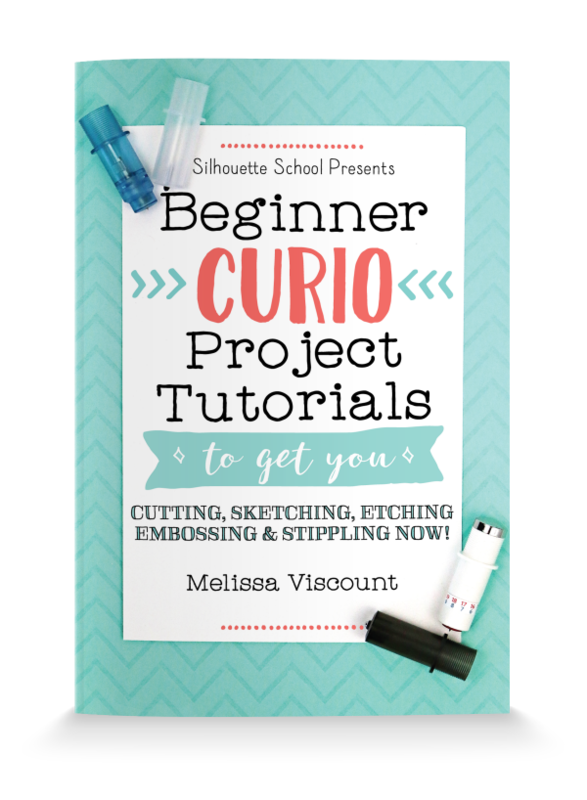 The Beginner Curio Project Tutorials guide includes one project (and one specially designed Silhouette Studio cut file) for each: cutting, sketching (and cutting), etching, embossing, and stippling. Please keep in mind - this is not a reference book the way my original and full-length book, The Ultimate Silhouette Guide is. The Beginner Curio Projects Tutorial booklet is a starter guide that's meant to get you off on the right foot. Now for where to get it...because you know you want it! The Beginner Curio Project Tutorial book is being sold exclusively by Swing Design...they're my peeps and they're awesome! Would I lead you wrong? Of course not! The Silhouette Curio book will be coming in paperback form with all Curio machines sold by Swing Design both their through website and through their Amazon store (how amazing is that?!). But because I know some of you already have a Curio, we're also offering it as a stand-alone purchase. Right now it's available only in ebook form (that means digital download) - but within the next week or two, the paperback version will be available for purchase, too! Alright get outta here...go order it and get your stipple on! The college application resume template is a site.It surely helps you in making a great resume for college.